This is our 20th Anniversary in business in San Diego, this is a momentous occasion for us in the Performance Industry and want all of our friends to come out and enjoy this special day !! We have 3 rounds of raffles and vendors comming down including ATD Tires, Darton Sleeves, B&G Suspension, Password JDM, Greddy and many more !! As well as raffle prizes from all these companies !! 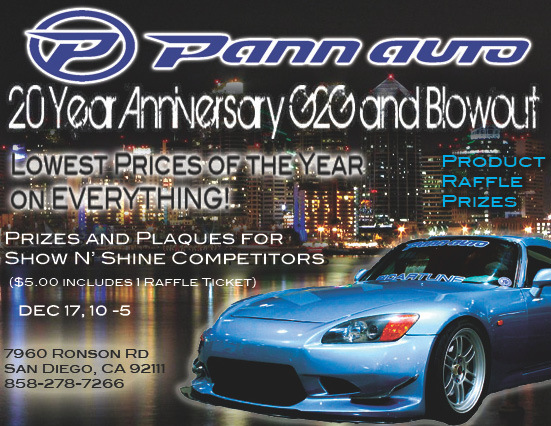 We will also be having a Show and Shine with plaques from Best Honda/Nissan/Mitsubishi/Toyota/Subaru/Team Award and much more… Registration for the SHow and Shine is 5.00 come and register ASAP with Jason@pannauto.com !! THANKS !! Updated Exhibitors List: Password JDM, ATD, BWR, Tanabe USA, WEDS USA, DC Sports, Megan Racing, Eeffect Apparel, Ninja Status, DEI, Flex-a-lite, Darton, Skunk2, GoTuning, Fat Kid Photography, B&G Suspension, MACKIN, TC Sportline, Buddy Club, CT-Engineering. 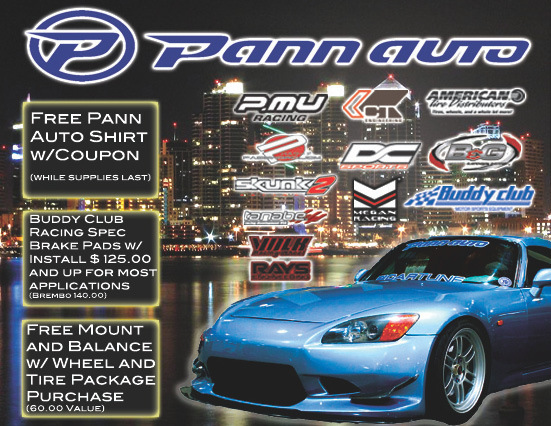 This entry was posted in Pann Auto News and tagged car show, Pann, Pann Auto, Sales. Bookmark the permalink.